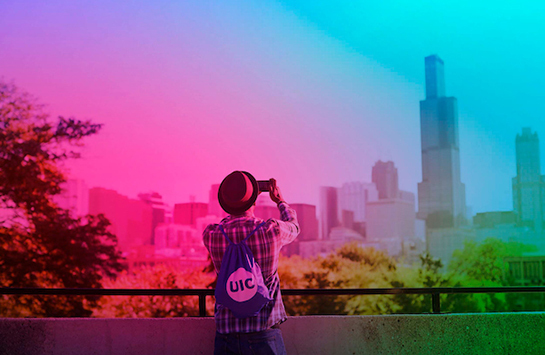 Images are an important component of UIC’s identity, providing perspectives of life in Chicago and showcasing the university’s academic excellence and accomplishments. Departments using photography and video in print and digital communications are encouraged to follow these guidelines and policies. The internal resources listed below can provide high quality photos and video for your needs. All campus units should use professional-quality images that represent the campus, its diverse students, faculty and staff and its academic and research endeavors in a positive light. Imagery should feel true to the university. The use of negative space and color is encouraged to showcase UIC’s vibrancy. When working with outside photographers, make sure that all contracts specify that UIC will own exclusive rights to the use of the images. This will allow the images to be used for current and future projects without having to purchase additional rights. Other than those photographed for news coverage by independent news organizations, any individuals who may be identified by their image must sign a photo release form before they are photographed for a UIC project. The release gives UIC permission to use the photo in any university communication vehicle or any outside medium used to represent the campus. It acknowledges that the signatory understands that the information may be published and shown in public and that there will be no compensation provided for its use.